The "Merlot" dress is constructed of rayon and cotton fabrics hand dyed and hand printed with metallic fabric paint. The dye process involves pouring dye over vertically hanging fabric to create the unique color combinations. 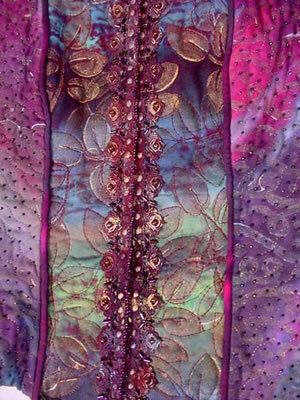 The bodice has princess seams with self piping, and is machine quilted and hand beaded. 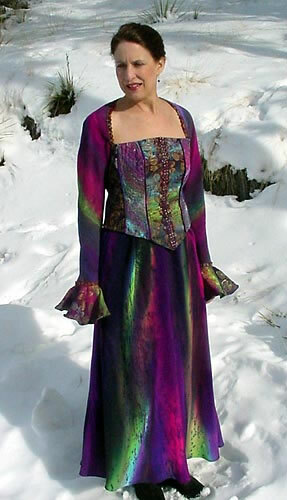 Lace trim along the bodice front, neckline, and wrists has been hand dyed, then accented with metallic fabric paints and glass beads. The bias cut rayon skirt is slightly flared.